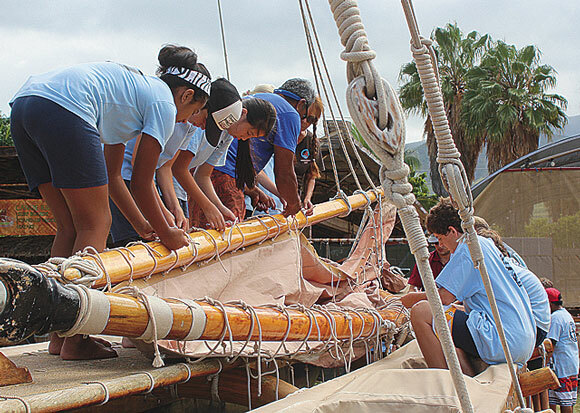 LAHAINA – The crews of the Hokule’a and Hikianalia are on a voyage of discovery, setting sail in June on a Worldwide Voyage – 46,000 miles across the planet. They won’t be alone, however; they’re taking the classrooms of Hawaii with them, the teachers and students young and old, on this cross-cultural, multi-international learning experience. The mission of the Pacific Voyaging Society (PVS) is to share the message of Malama Honua (care for the Earth) and to become a catalyst for positive change through education. Over the 48-month crossing, there will be altogether (at different times) 400 crew members from 16 countries on board the sister ships from Hawaii, including educators and scientists. Hikianalia, the solar- and wind-powered double-hulled canoe, will serve as a platform for the study of marine science, educational outreach, communication and teacher training. The Hokule’a will continue as cultural ambassador, sharing the skills and teachings of ancient Polynesian wayfaring and practices of sustainability. During the four-year global trek, more than 100,000 students and teachers will be connected virtually to the PVS’ third canoe, hokulea.org. “The involvement of our youth has been one of the most powerful aspects of planning for this voyage,” PVS President Nainoa Thompson explained in a press release. The goal is to impart the wisdom of the wayfinders of the past through A’o Hawaii. A’o means to teach and to learn, and the value is reciprocal. Through a grant from A’o Hawaii, Mary Anna Waldrop of Sacred Hearts School in Lahaina is one of 20 in the state selected to facilitate the educational crossing. She was surprised by her selection, but West Side community leader Diane Delos Reyes was not. 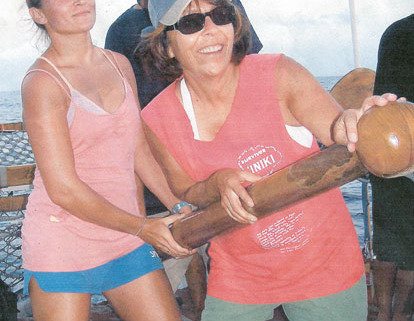 “Mary Anna is a true wayfinder,” she commented, “not only as a voyager of the sea and the planet, but in the educational and spiritual sense as well. Ms. Waldrop has been preparing for this experience most of her life. “I spent ten years living on a 30-foot sailboat, and I spent seven of those ten years cruising around the Pacific,” she said. The veteran educator has encouraged her seventh-graders to design their own curriculum for their eighth grade experience next year, blending the traditions of the ancient voyaging culture with modern science, technology, engineering, mathematics and social studies. Middle School student Summer Macedo aptly defined the philosophy behind the groundbreaking curriculum. “We learn from each other and teach all we learn. We test the boundary of traditional education, turning boring school books into creative activities and fun lessons that we can actually understand. Our teachers transform into students, and the students transform into teachers. Students push their minds past their limits into knowledge and wisdom they can’t even imagine,” she said. Ekolu Lindsey, president of Maui Cultural Lands, has firsthand knowledge of Waldrop’s talents. 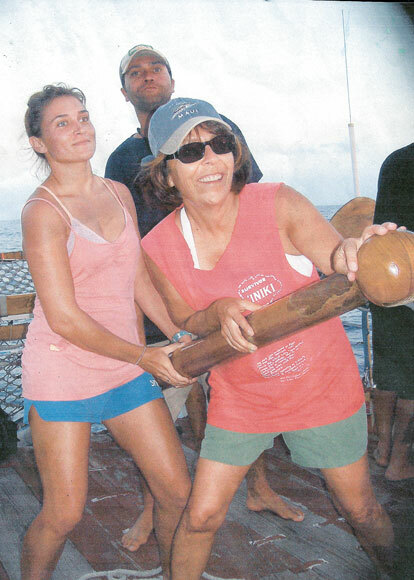 As an ambassador of the WWV, Waldrop is ready and willing to share the knowledge and has given presentations at Holy Innocents Church, Sacred Hearts School and Lahaina Yacht Club. “I want people to know that they can contact me through my e-mail (Mwaldrop@sacredheartsschool.net) if they want me to speak to their organization, club or if they want me to come to their school. I am very happy to do that,” Waldrop said.